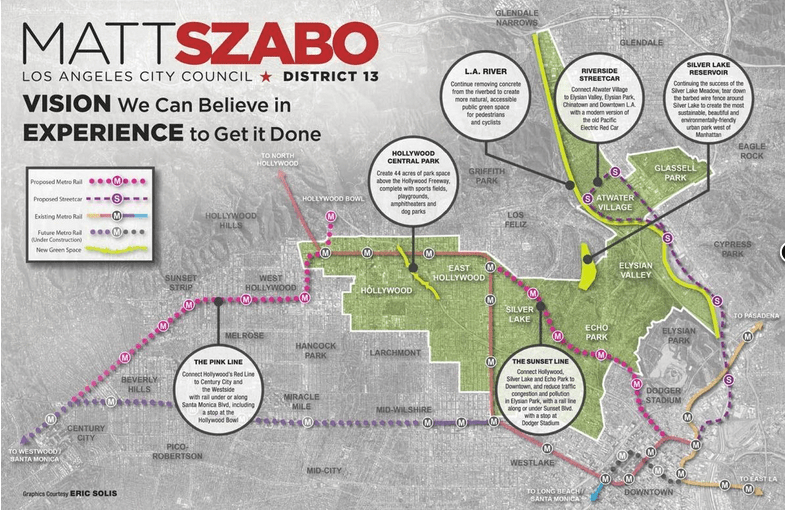 ##http://la.curbed.com/archives/2013/02/council_candidate_calls_for_sunset_rail_line_riverside_streetcar.php##Curbed## covered a plan by CD 13 candidate Matt Szabo to make Sunset Blvd. a Livable Street. While the Los Angeles County Bicycle Coalition (LACBC) and Streetsblog Los Angeles are 501(c)3 non-profit organizations and cannot endorse candidates, both organizations can get candidates’ views on bike planning and policy to better inform voters on where these candidates stand on issues that affect you. This year, eight of the fifteen City Council offices will be voted on tomorrow. Six of those eight offices have no incumbent Council Member. The LACBC offered each candidate a chance to respond to a survey on bicycle and pedestrian issues. Streetsblog Los Angeles filmed two candidate debates with interviews with the participating candidates afterwards. We also previewed the 5th Council District race in what we then thought would be an ongoing series on all six races for which we thought we would not have video. Links to the candidate surveys, videos, and other Streetsblog coverage can be found after the jump. Below is your list of leading Los Angeles council candidates. If their name is highlighted, it will take you to their LACBC survey. If there is Streetsblog media available, we’ll make note of it. Watch all three candidates at a two hour debate on livability on Streetsblog TV. Read our review of the debate at Streetsblog Los Angeles. Read our story on Streetsblog Los Angeles. Watch all four candidates debate livability at a two hour debate on Streetsblog TV. Matt Szabo may be a transit booster (he chaired the Measure J committee), but his vision displays a notable failure to grasp how transit lines are operated. Running that Sunset Line out of Union Station would mean that parts of the Red, Purple and Pink lines would have 1/3 the maximum potential frequency. You seem to have left Matt Szabo out of your list on Council District 13 – I can’t tell if he submitted answers or didn’t, though he does appear to have free advertising here! Metro Sunset Line Chinatown Gateway Underground Light Rail Subway Station will be built on Ord Street between New High, North Broadway and Hill Streets adjacent to Jia Apartments, Chinatown Gateway Dragon Arch overhead bridge gantry poles and Chinatown Library along with Metro Sunset Line Dodger Stadium Underground Light Rail Route happens in the future upon the completion in 2024 along with 2024 Los Angeles Olympic Games. Advocacy and Endorsements, the Next Step for Bike Advocacy?